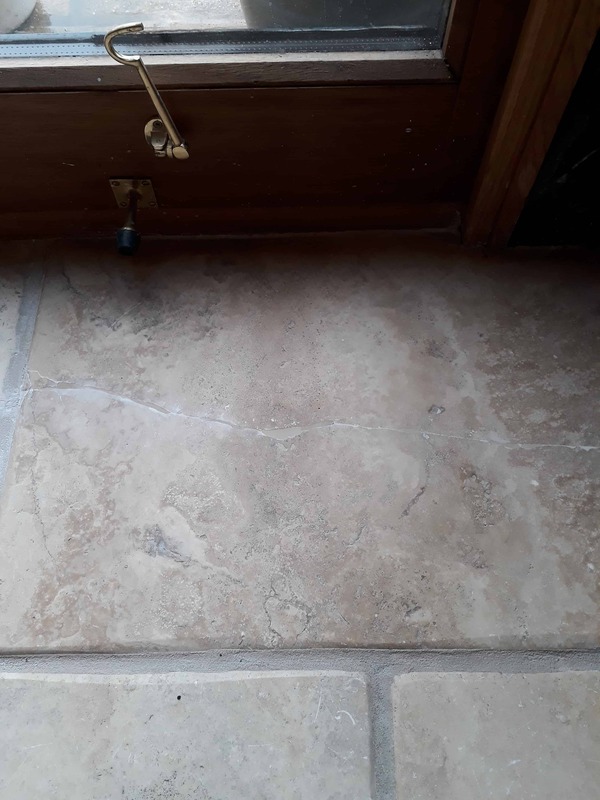 Our client got in touch from Attleborough a market town between Norwich and Thetford to ask for our help restoring her kitchen and dining area floor. 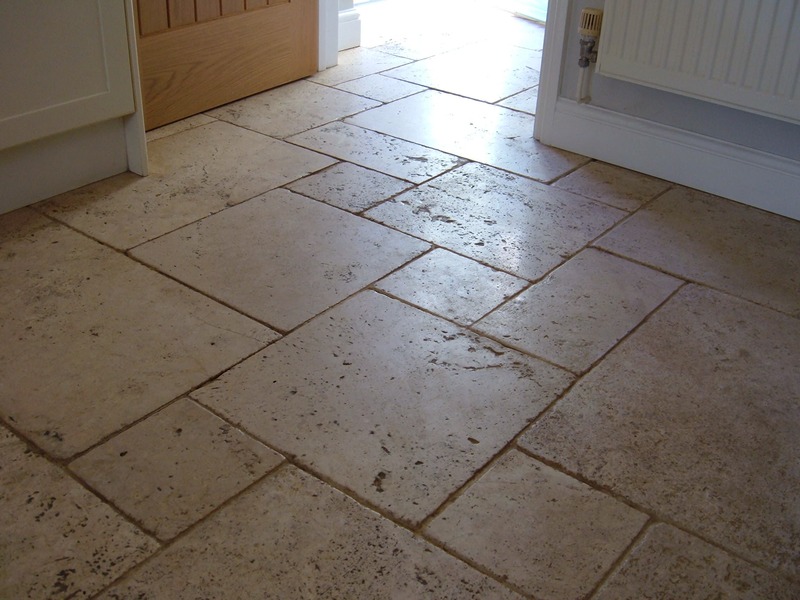 If you live in the countryside and have children and pets, unfilled Travertine is probably not the best choice for your kitchen/diner flooring, which is the conclusion our client discovered for herself. The floor was only around three years old, but the entire area had become heavily scratched and soiled. Most of the dirt was occupying the unfilled pits in the stone which are an inconvenient feature of this natural material. No amount of daily vacuuming, mopping or rinsing will ever shift this kind of contamination which is why she called us in desperation. 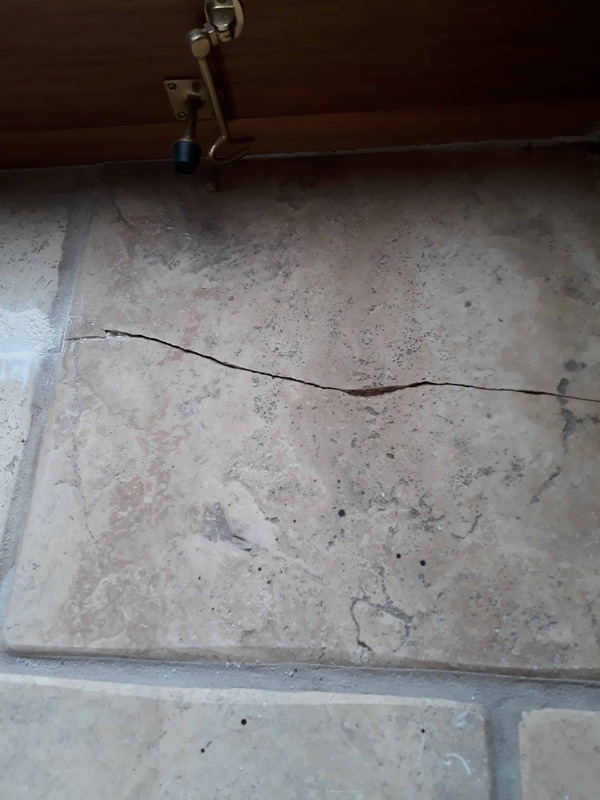 During our site visit, apart from the obvious heavy soiling, we also noticed a very prominent and ugly settlement crack which had appeared along the French doors leading to a four mm difference between the surface levels either side of the crack itself. 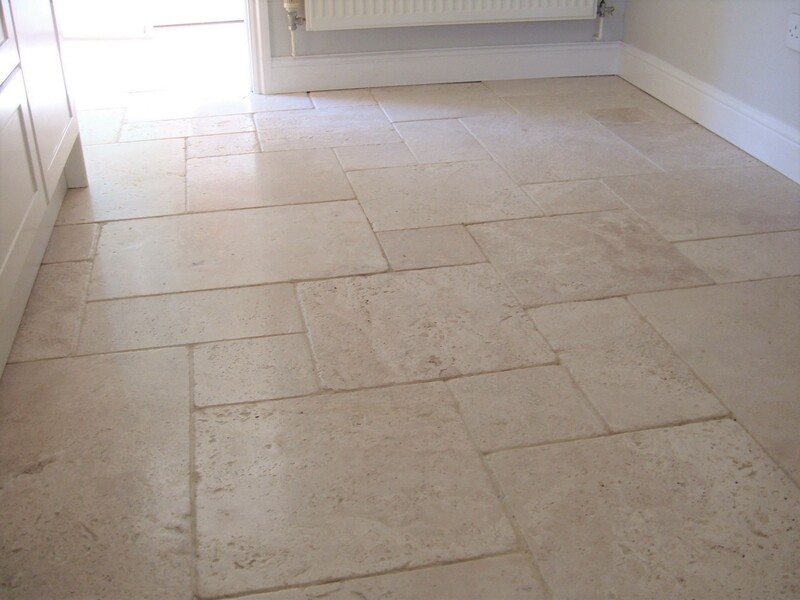 Our first job was to deep-clean the soiling from the floor using our heavy 17″ rotary machine fitted with a medium-soft brush and a 1:5 mix of Tile Doctor Pro Clean, diluted with very hot water. This combination made quick work of the surface dirt, along with the soiling in the grout lines. The resulting slurry was left to dwell on the floor for ten minutes to soften the residue sitting at the bottom of the pits before being power rinsed and vacuumed away using our 400psi hot water extraction machine. 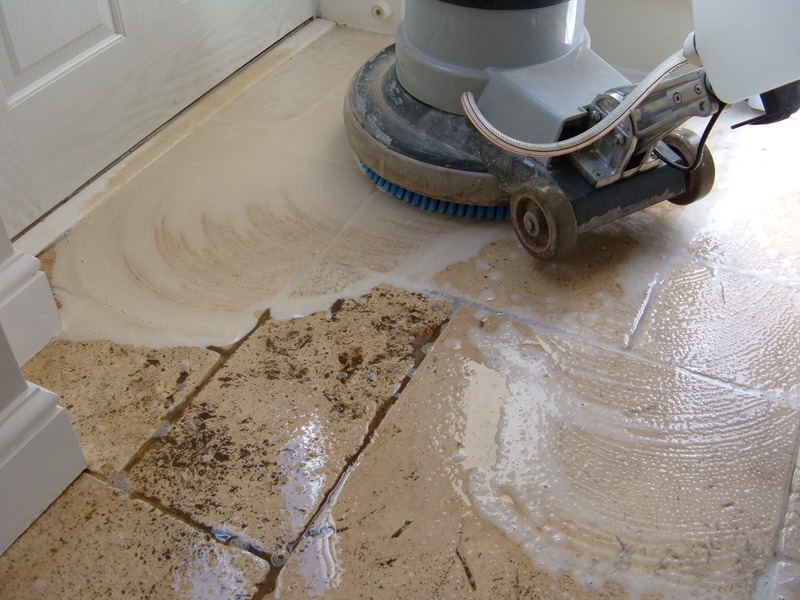 The machine was fitted with a specialist hard flooring wand which blasted the softened dirt out of the pits and immediately sucked all the contaminants up. This avoids anything spraying up the adjoining walls. Having removed all the dirt, we then cut and polished the area again with the rotary machine but this time using Tile Doctor Diamond Burnishing Pads from 400-grit through to 1500-grit, rinse extracting between each stage to remove the resulting slurry. Internal corners were finished with hand-held diamond blocks. We then left the whole area to dry thoroughly overnight with assistance from our large capacity dehumidifier. On our return the following day, we repaired the unsightly crack along the threshold by grinding the high lip down to the same lower level using a diamond blade fitted to our Bosch multitool. Followed by polishing with our Festool Rotex 90 Handtool. The crack, being rather wide, was then filled with a two-part epoxy stone repair compound and levelled with the Rotex after curing. After this, the floor was vacuumed thoroughly followed with the application of the a very fine 3000-grit diamond burnishing pad which is applied to the floor with a little water spayed onto the tile. This fourth and final burnishing pad really builds up the shine on the floor. 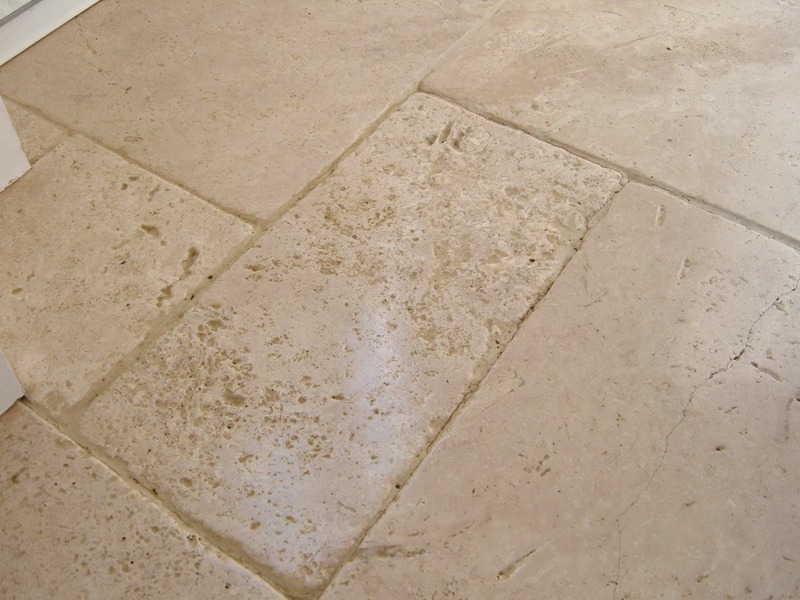 Our client really loved the new lighter look of her cleaned Travertine floor, so we chose to use Tile Doctor Ultra Seal to seal the floor and protect it from staining. Ultra-Seal is a matt impregnating sealer that soaks into the pores of the stone protecting it from within and without affecting the colour of the substrate. The sealer was liberally applied and allowed to be absorbed by the stone for a few minutes before the excess was removed. After an hour, the surface was re-burnished with the 3000-grit diamond pad and then vacuumed to remove any fine dust generated during the burnishing.